Teachers working with students on ELOs may experience a significant change in their interactions with students. Teacher time and effort is spent less on instructing and directing students, and more on coaching behavior and application. Coaching an ELO isn’t harder than traditional teaching – it’s just different. ELO coaches, as in a sport, do not do the work themselves and often can’t foresee the exact outcome of their efforts, but their expertise, attention, and feedback give students the opportunity to accomplish their goals. Coaching an ELO requires enough familiarity with the material to allow for mistakes, encourage exploration, and reward risk. Coaches often work in teams, with specific roles assigned to each person. they become mathematicians, historians, or artists, engaging in all the messy decisions, uncertainties, and successes that come with real work. This reflection ELO Journal template (MSWord) shared by Angela Bourassa, ELO Coordinator at Manchester Central High School, is an example of a useful formative assessment tool to track a student’s progress. A student needs to be doing most of the work in an ELO, not the teacher nor the community partner. This is often a subtle yet very important shift in student thinking. Good student communication improves feedback, goal setting, and collaboration. A clear reflection structure is a useful tool to fuel this growth. When reflection is done right, it elevates the student’s understanding of what they’re learning, how they learn it, and who they are as learners. It provides opportunities for them to develop a habit of self-advocacy and a feeling that they are finding their way in the world. When a student is doing his or her work and reporting regularly in a clear reflection structure, the adults are free to focus on the direction and execution of the ELO. This does not mean students should be able to go for periods of time without accounting for their progress or lack thereof. Students often go incommunicado when they run into challenges, and it’s the adults’ job to look out for red flags during the ELO, especially if the red flag is a lack of communication. Community partners should be encouraged to engage with students in their reflection process by any means available to them. Teachers and community partners both coach students doing ELOs. They may use different vocabularies and go about helping students in very different ways. In order to complement each other’s efforts, both need to articulate what each brings to the ELO and to the student. Both contribute to the ELO design (along with the student), both give feedback on student reflections and research, and both provide their own perspective on the student’s project and presentation of learning. 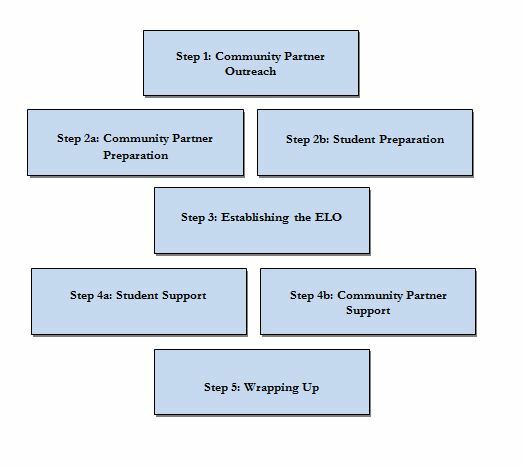 Developing and nurturing community partner sites is a key element in overall ELO program success. The Community Partner Template outlines important steps and strategies for building strong community relationships. Completing and following the template will help make an ELO successful, and help the staff of an ELO program navigate and keep track of the variety of tasks required to support an ELO. Note that the template is a guideline for a process; it does not substitute for a handbook of policies and procedures for your school’s own program. The template has five steps, some of which can be done at the same time. Steps 2a and 2b can be done at the same time, as well as steps 4a and 4b. Feedback can be brief but should use a consistent reference point. Rubrics are useful to collect a snapshot (formative assessment) of each feedback session. Multiple snapshots will provide a vision of the student’s evolving successes and challenges.